Brilon is easily reached by train from all over Germany. It takes roughly one hour on foot from the train station to the car park for hikers (Wanderparkplatz). Alternatively, one can take a taxi. Take the motorway A 44 exit 'Erwitte/Anröchte' or 'Wünnenberg/Haaren'. From here, continue in the direction of Brilon. Follow the 'Burhagener Weg' out of town to the car park for hikers 'Hilbringse'. From Berlin, Braunschweig, Hildesheim, Hamburg, Göttingen and Kassel, it goes with the 'Fernbus' (long distance bus) low-priced and relaxed to Brilon. With a history stretching back over one 2,000 years, the Borberg (670,2 m) is a very popular hiking destination in the Rothaargebirge. The mountain is located about 5,5 km south of Brilon. Foundations of a church and a cemetery from the 13th century were visible during excavations around the turn of the century. The Borberg terraces with its ramparts, ditches and hills attract the attention of the visitor. The oldest earthworks come after the findings of multiple ground-breaking research dating back to the birth of Christ, when Germanic tribes ran on the Celts. The fortifications were renewed as a wall castle in the time of Charlemagne (8th/9th century). At the highest point you will find the 'Chapel of Peace' (Friedenskapelle), also known as 'Lady Chapel' (Marienkapelle). The chapel was built in 1923 and is a place of pilgrimage in the Diocese of Paderborn. From the chapel, you can enjoy beautiful panoramic views over Olsberg and the Sauerland mountains all around. You can hike the Borberg on various roads and paths. One starting point is the car park for hikers (Wanderparkplatz) 'Hilbringse' nearby the 'Hiebammen-Hütte', a small forest restaurant with cool beer and delicious sausages. The Wanderparkplatz is located about 15 minutes from the town centre of Brilon by car. Who walk through the old town of the historic Hanseatic City and former capital of the Duchy of Westphalia, wanders through many centuries. First mentioned in 973, Brilon transformed itself into one of the most important Hanseatic cities in Westphalia. Brilon's attractions, such as the Town Hall, one of the oldest in Germany, the marketplace or the Priory Church (Propsteikirche), are worth to be discovered on a tour through the old town. The Michaelis funfair (Michaeliskirmes) of the town Brilon is celebrated for over 500 years and takes place usually on the fourth weekend in September. It is the largest inner-city funfair in the Hochsauerland. Highlight: The fireworks on the opening day (at the Kalvarienberg). This family-run hotel offers large rooms, free Wi-Fi, and a spa area with an indoor pool. 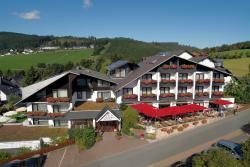 It is located in Willingen town centre in the beautiful Diemelsee Nature Park. Located in Willingen in the beautiful Diemelsee nature reserve, this 4-star hotel offers stylish accommodation, an elegant à la carte restaurant and a heated indoor swimming pool.